Developed and approved using reference from the 20th Century Fox Archives, this gold plated ring artfully encloses a high-quality simulated emerald stone. What do you give the Vampire that has everything... including his soul? How about a tan, or better yet--near invincibility! Officially discovered by Harmony, it was taken from her by Spike, removed from Spike by Buffy, and finally given to Angel by Buffy via a road trip by Oz. This "Vampire Holy Grail" has been around! Mystically imbibed with the power to allow vampires to walk in the daylight, this Gem of Amara ring leaves the undead (almost) invincible! First seen in the Season Four episode, "The Harsh Light of Day” this prop replica ring is perfect for Buffy & Angel fans, Vampires, Vampire fans, and even people who just like cool jewelry! 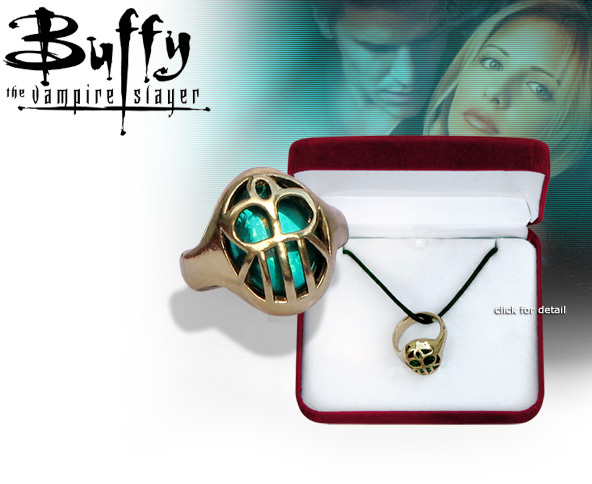 Fully licensed from 20th Century Fox, this gold plated ring and simulated emerald are presented in a velvet box milled with the Official Buffy Logo. Included with the ring is a high-quality necklace so you can wear it as pendant as well!